This document was originally written for a friend to keep with the garters I tablet wove for her in late 1993. Some minor changes accompanied the move to the web. I wove these wedding garters for a friend in December 1993. She wore them on the occasion of her marriage, 1 January 1994. The theme of the wedding was Elizabethan; the bride and groom wore reproduction Elizabethan clothing. The garters are tablet-woven of red and white lacemaker's silk. Although conceived as part of a late sixteenth-century woman's dress, their appearance was inspired by seventeenth-century pilgrims' ("Jerusalem") garters. The garters are 52.5cm long, 1.1cm wide. The red silk was hand dyed using madder root, a small quantity of oak galls, and an alum mordant. 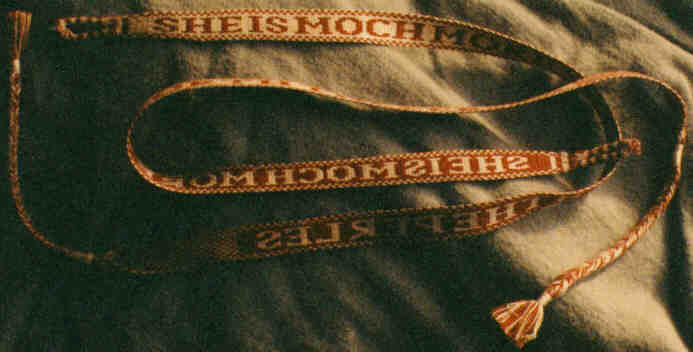 The inscription is woven in double-face double-turn, a reversible weave. The lettering is drafted on sixteen cords. The tubular-woven loop and the hanging end are plain weave, the former in stripes and the latter in small checkering. The hanging braid is a five-strand guilloche inspired by braids bordering some of the tenth-century tablet-woven relics of St. Cuthbert. The text of the inscription is "she is moch more worth the perles." This is taken from the Coverdale Bible's (1535) rendition of Proverbs 31:10: "Who so fyndeth an honest faithful woma[n], she is moch more worth the[n] perles." Proverbs 31:10-25 outlines some of the salient qualities of a virtuous wife, including such talents as skill with handiworks, business acumen, and wise counsel. The education and upbringing of a noblewoman in the Protestant England of the sixteenth century would have included, for the first time in history, familiarity with the Bible in English. Accordingly, this text is both a literary reference resonant with meaning for an educated noblewoman of the time and a wish for the fulfilling of a spiritual role model equally highly regarded in the late 20th century. This page was created on 7 November 1997 and last updated on 4 October 1999.